My last attempt at extruder mounting took me backwards. The new mount used a weaker mount and smaller stepper. With the direct drive EZstruder, it just wouldn't keep up. I found a nice peace of beautiful hardwood scrap and rebuilt my mount again now with fan mounts on bot sides. 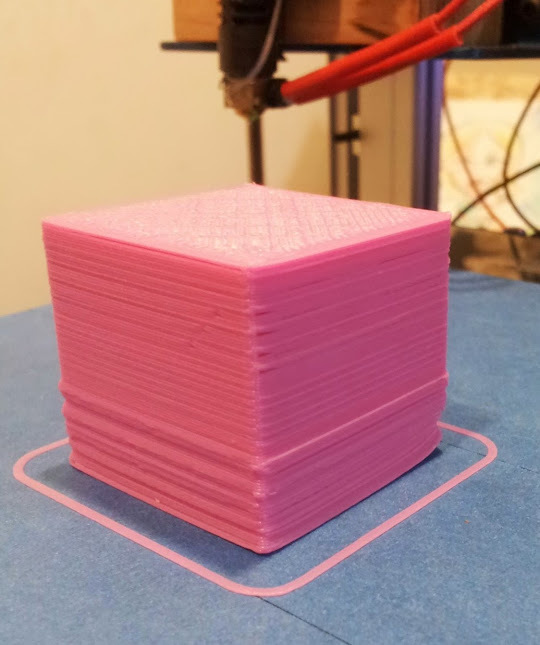 Now my printer is doing better than ever on the first 15mm calibration block. I'm super pleased. 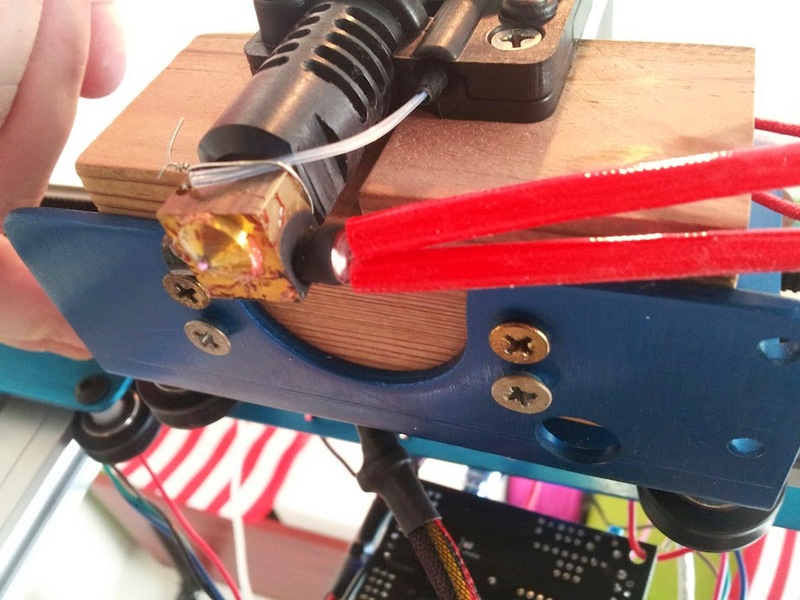 The cooling certainly has a big part of it, but the bigger stepper for the direct drive extruder is also helpful and I wonder if the mount being across the entire shelf add a certain amount of stability to it. This one also makes room for a dual extruded setup in the future, maybe even three extruders. Here's a few shots of the new mount made entirely on the table saw. I need to work a bit on my heatedbed temperature. I also have some wiggle in my X and Y still, just a bit. I think I'll be printing a couple new mounts soon to deal with that. A few more tweaks to get a few more things working right. It should be noted that I have it setup to turn itself off after a certain number of seconds of inactivity. This works with mechanical endstops with the Y homed to MAX and the X and Z homed to min, but using the MAX pins. I've recently upgraded my Repetier Firmware to 0.91. Attached is the configuration.h for folks who are interested in putting together a similar bot. I finally got my FT231x on the Azteeg X3 replaced. I burnt that chip and was limited to basic serial communication. In the mean time, I rewired the printer running all the cables on the inside of the extrusion that I could. 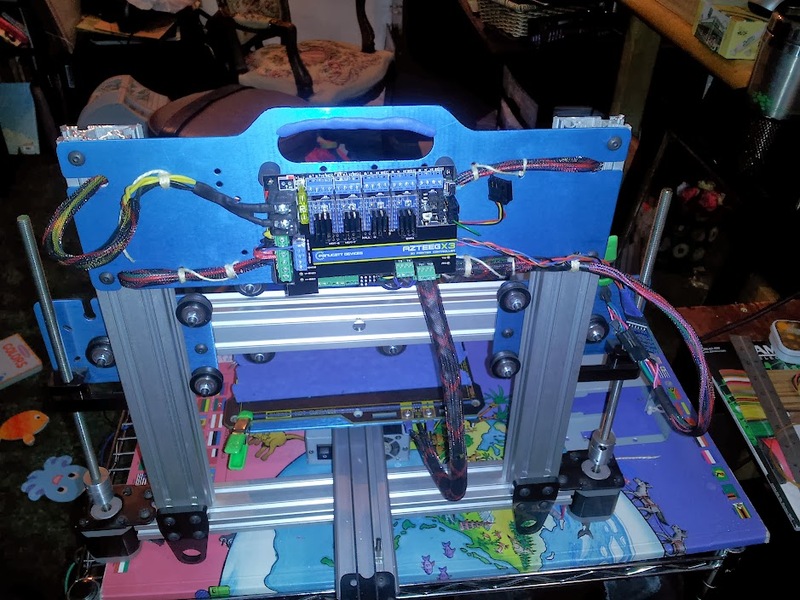 I also mounted the X3 high enough off the back plate to allow me to solder in connectors on the back and run my endstop and stepper lines under the board cleaning up the look a great deal. 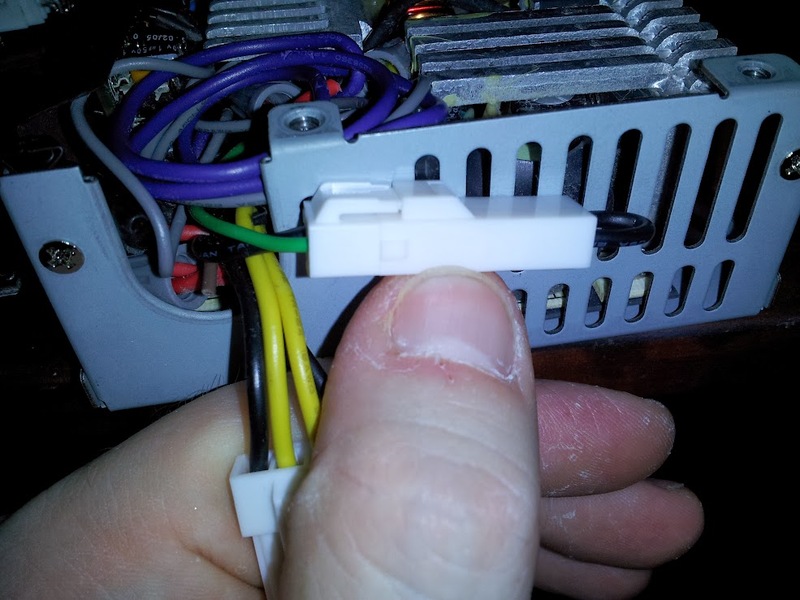 For that I used the Molex KK series and in conecting the other end of the steppers I used some mini-fit connectors. I also found Elmer's school glue sticks work much better than the blue painter's tape for my purposese on ABS. I've also started messing with PLA, but that seems to be more touchy about bed leveling so I'm getting a lot of curled up corners with the PLA I'm using. I had found that the way I configured my Y axis with the endstop had flipped my Y axis so the Y position 0 was actually Y position 200. Once I told the robot to home to Max and had the proper max pin set, it seems to be no longer doing any mirror image printing. I think these are my final settings for the axis at this point. I also attached the whole Configuration.h since I'm sure I've tweaked a few other things I'm forgetting. 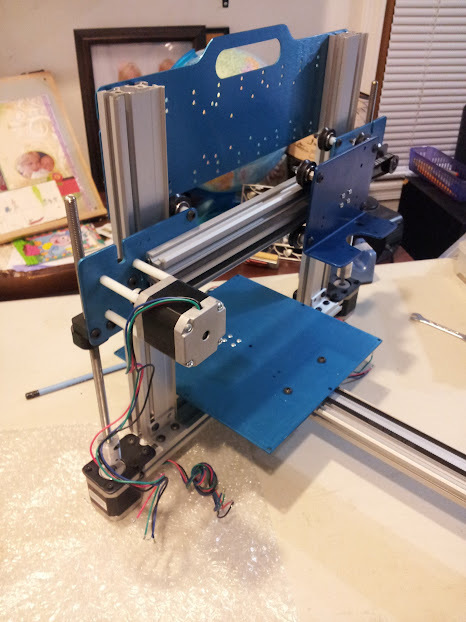 // I have my min and max pins reversed on the Azteeg X and Z axis so that I could add a connector to my endstops on the back, where I could easily solder the connectors on without desoldering. I don't use the max, just the mins so this provides that option and keeps my cabling clean. Oh yeah, one more thing. 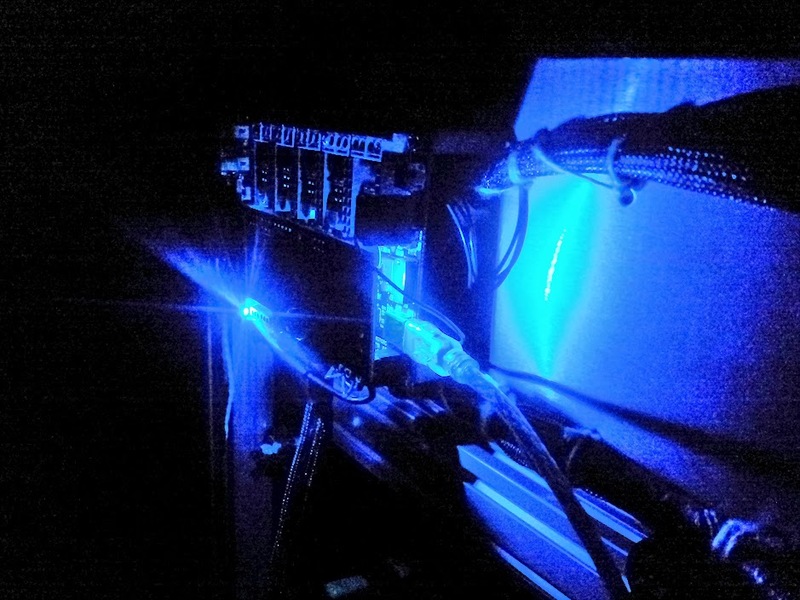 I've wired up the ATX power supplies power on pin so I can turn on and off the 12V from firmware. I then set the firmware to automatically turn off the power supply when idle the same way it does the steppers by setting #define MAX_INACTIVE_TIME 1200L. 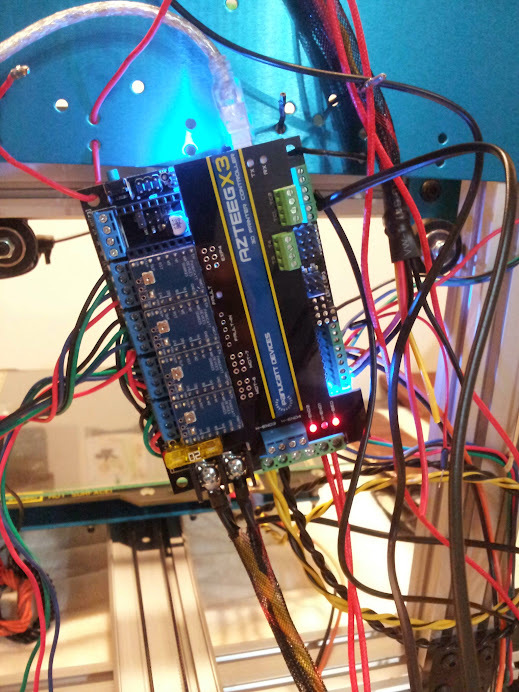 Then I commented out #define ENABLE_POWER_ON_STARTUP so that it wouldn't turn the power back on after each reset and in slic3r's printer settings I added M80 ; make sure the 12V power is on to the top of the Start G-Code window to tell it to power on before it tries to move or heat up. I honestly turn that all on manually while I'm getting a print sliced so it may not be strictly required. 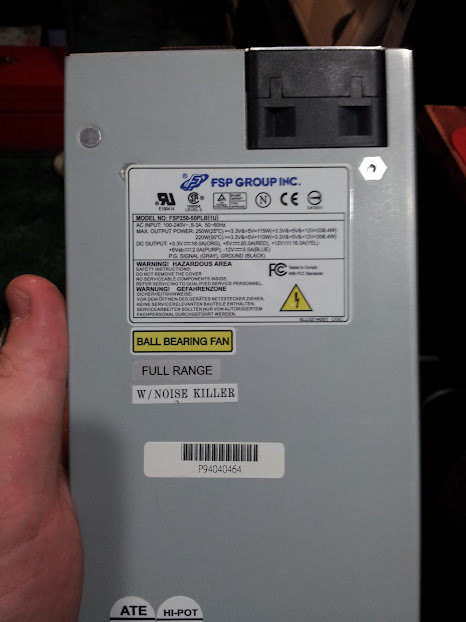 I like the reduced noise of the power supply when I'm not using it and the energy savings are nice too in case I ever need to get this thing Energy Star rated. You've made it this far so... the not quite completely cleaned up wiring looks like this. These belt clamps that came with the ATI kit are clearly not cutting it. I'm getting the belt sliding in them again. I tried printing some new ones, but the belt slide seems to be impacting that. I should have don that first thing last time I fixed it. Anyway, do you guys have any recommendations or mods for improved belt clamps? Today's lesson is that if the EZStruder gets put on backwards and you try to use the 3mm side for the 1.75mm plastic, it will likely cause the plastic to jam. Don't do that and you'll avoid awkward jams after two layers. Looking back, I can see my last picture shows it backwards. Also, if you blow yout your FTDI on the Azteeg X3, it is possible to rig up an FTDI Friend (that's what mine from Adafruit is called) to the J2 header and communicate via that instead. Sometimes I have to pull the FTDI friend off the X3 and put it back on after connecting to get it to respond to commands, but it does work. I'll try to replace the FTDI chip later. I soldered some right-angle KK connectors to the bottom of the board so I can mount the wires under the board and make it pretty in the final construction. I added a connector to my power supply to allow me to eventually run a wire up to the X3 to have the Arduino turn the 12V on and off as needed. For now I just have a jumper on it. I also made the first print of my X3 mount adaptor. I think I'll need to lower or remove the wire tie mounts entirely since I soldered the connectors on the bottom. Also, I did this on Make Lehigh Valley's reprap which seems to have some belt slippage and I didn't level the bed so it isn't quite right. I may also have the Arduino Mega hole flipped on one or both axis. I haven't figured that out quite yet. Looks like a released the magic smoke in my FTDI chip on the Azteeg X3. I'd just changed over to USB power and put the daughter board on while the board was powered. Apparently, that is a very bad idea. I guess I need to go find my external FTDI board and do some soldering. Thanks, I was looking for that in Slic3r, but couldn't find it. I did find the slowing down, but I think once it hits the top, it really should have more options as you mentioned. Know where it is? I was also considering some ducting to distribute the air flow. I printed out the starship cooler on thingiverse, but it doesn't work at all on my setup and I don't see an easy way to modify it. I'm dreaming up some other options. Maybe it's time to start a slicer comparison thread to see why people pick what they pick. It may help to turn on the Orbit feature (that's what's called in Skeinforge), which increases the time it takes to print the very small layers, enough for the plastic to solidify properly. 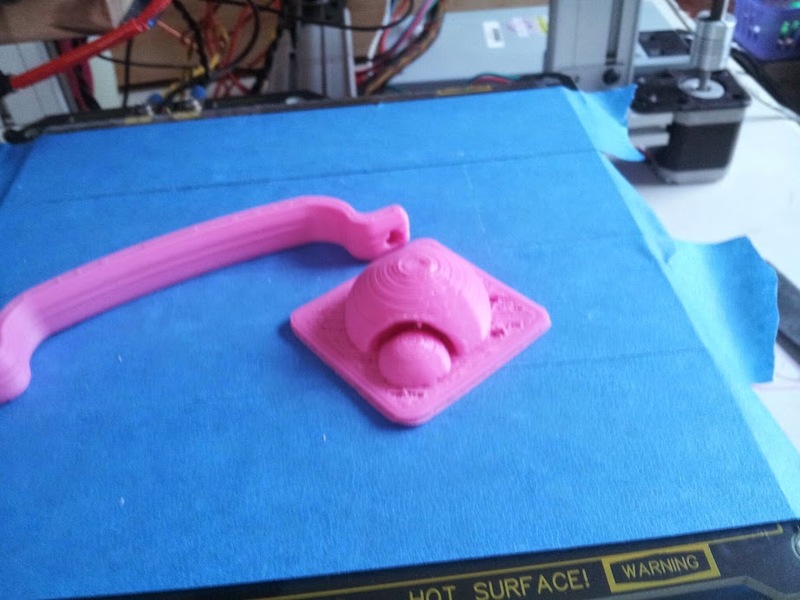 It is even more effective with a fan, because the hot end "orbits" around the print while waiting. The alternative, slowing down on small layers, doesn't work nearly as well, in my experience. 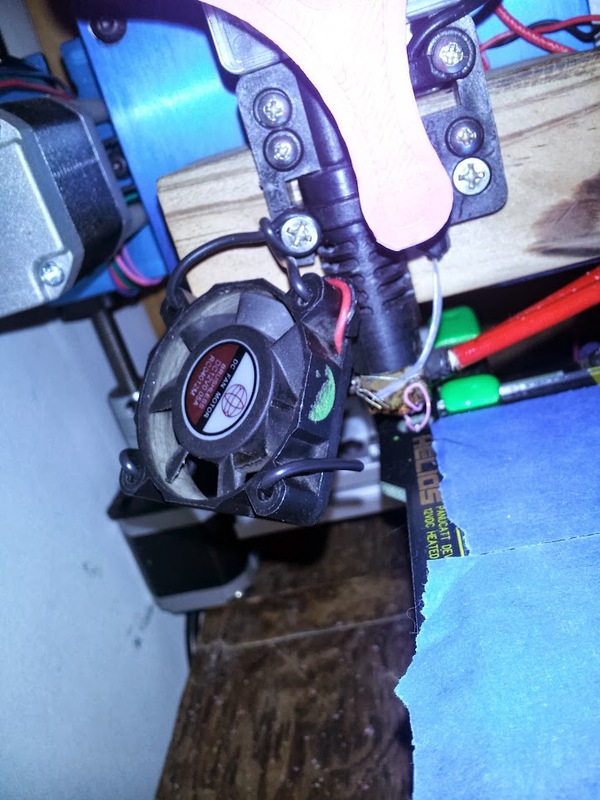 With the hot end right there, covering the layer almost completely, the plastic doesn't cool enough, fan or no fan. 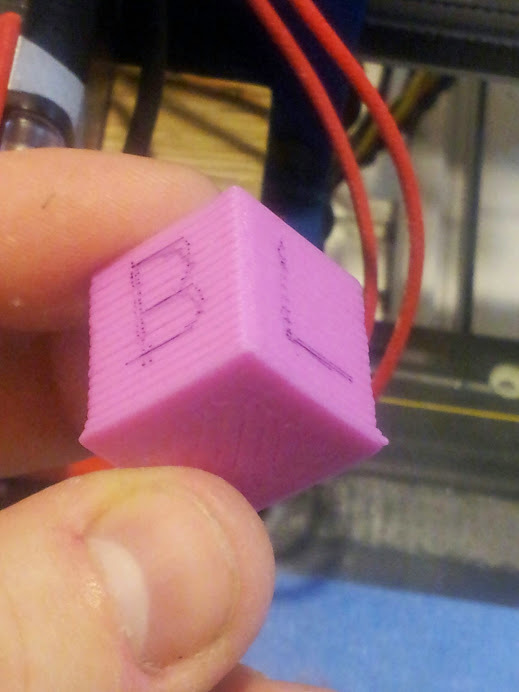 Wow, what a difference a fan makes in printing ABS. I still have some issues with the top of this very small print. I may just get a fan that moves more air. 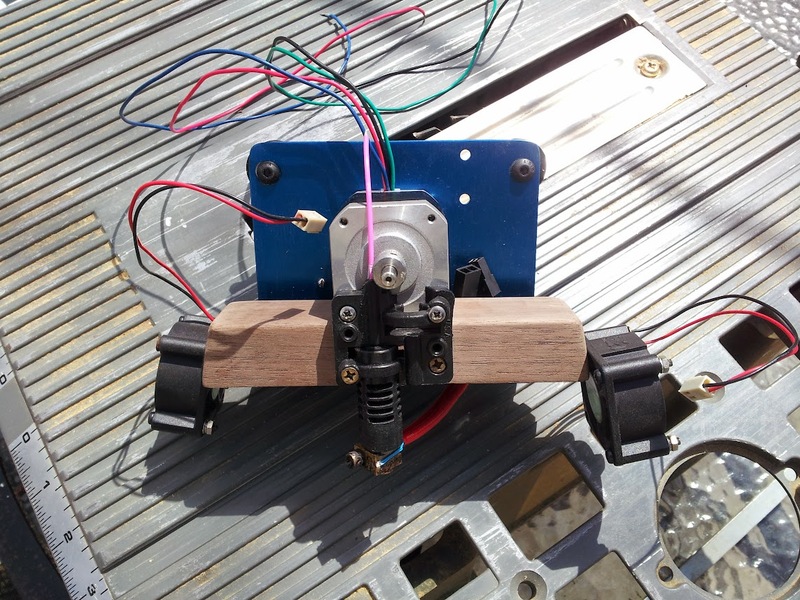 Here is an image of how I mounted the 40mm muffin fan to the EZ-Struder, at least for now. It's a simple bit of heavy gauge solid wire wrapped around a screw and through the mounting holes on the fan. 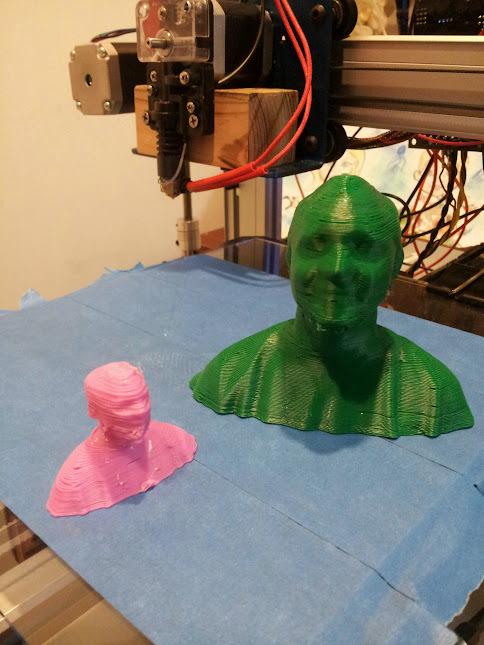 Here is a before and after pic of the print job. Note: I haven't yet heard the beeper or light pins or looked into if these settings are correct. They are simply the defaults. So the Z-axis hangup seems to have been resolved in me widening the space between the upright extrusions which were causing the wheels to have a dent in them. Also, I found that the material I wedged into the belt clamps to secure them didn't work as well as I thought and was indeed allowing the belts to slip. It worked initially which is why I had ruled that out, but when I finally gulped my pride and went back over my work I found that error on both the belt mounts. I put in a different material that I don't think will compress to resolve that. It's good for now, but I'll watch it. Mechanically, I think I'm all set. I'm now playing in OpenSCAD to build a mount for the X3 that has extra space under it to run wire. I've attached it as it actually is complete, but I'm trying to add a new feature which I can use to pass zipties through. Comments on possible improvements are welcome! 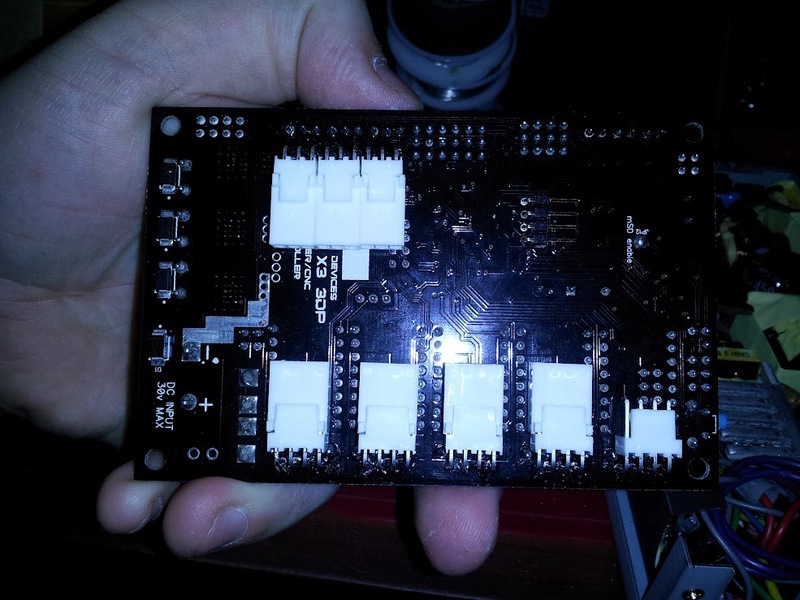 Also, feel free to steal the modules for the X3 and ArduinoMega standoffs for your own purposes. standoff_inner_radius = 1.75; // How big a hole should be in the middle of the standoff? standoff_wall_thickness = 3; // How thick should the walls of the radius be? height_x3 = 15; // How tall should the X3 standoffs be? 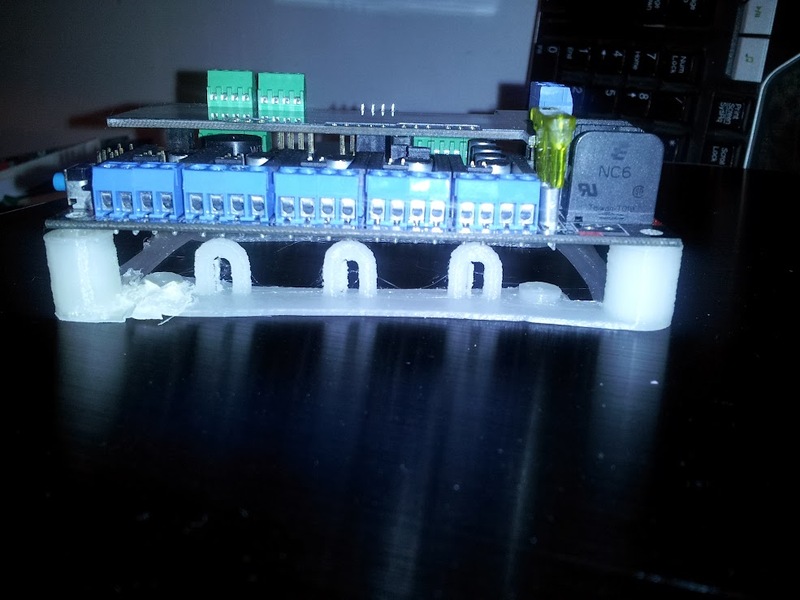 height_am = 3; // How tall should the Arduino Mega standoffs be? Thanks. I've been contemplating taking it all apart, drilling holes for the wire, giving the v-wheels a closer look and that sort of thing. I'll look for some time to do that and get a bit more familiar with my printer. Loose belts, loose V-wheels and loose pulleys can all explain the non-round circles. That's probably also what causes the infill not to touch the perimeter, if that's what you mean by "holes". It could also be loose screws -- pretty much anything that moves but shouldn't. As for your gantry, it's plenty heavy to slide down on its own, so the fact that it doesn't is worrying. Check the V-wheels. They should roll smoothly, and they should be tight but not too tight. As a guide, you should be able to force a V-wheel to turn against the stationary rail with your fingers, but it shouldn't be easy to do so. At any rate, there shouldn't be any wiggle room, but the gantry should move smoothly and without too much resistance. Make sure the V-wheels and the rail are clean -- even a small speck of dirt can interfere with smooth movement. I haven't yet figured out why the circles aren't round. I can't figure out if I should blame hardware or software and I'm also not sure why I'm getting those holes in the prints. I should probably set aside time to focus a bit more on just one problem, but I think I need to get my wiring cleaned up first so that nest of potential issues is out of the way. Ah, the belts! 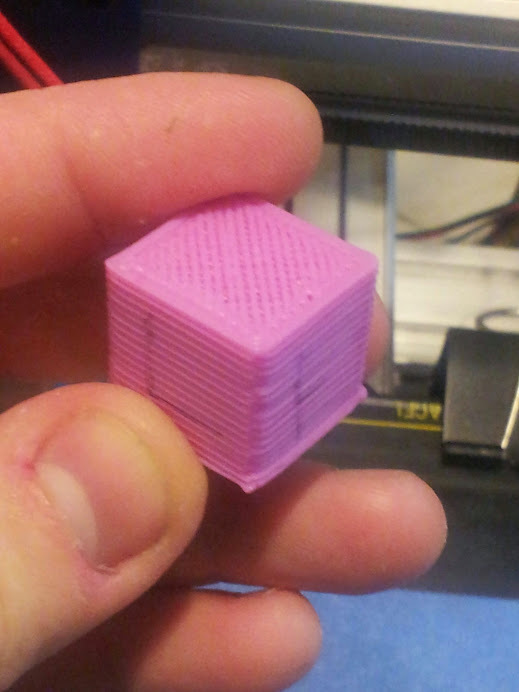 Yep, I took another crack at tightening the X-Axis and the calibration thing I'm printing looks much more round. 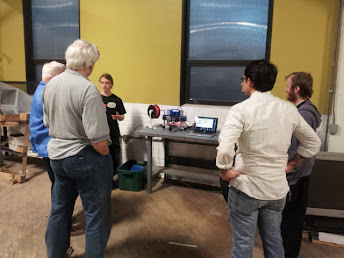 I have some other issues, but I just carried it back and forth from the hackerspace. I think that may be bed level issues. 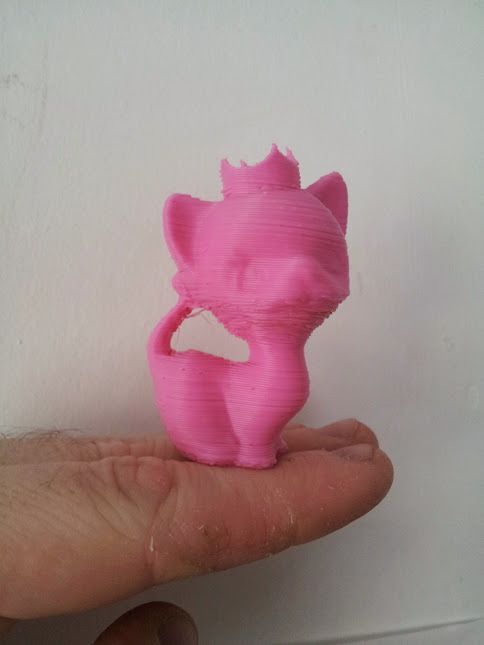 Edit: I spoke too soon, as this is printing more it is showing it's not so rounded-ness. It might be a bit better though. I'll have to print something I printed before to be sure. If your infill and perimeter don't connect only on one side or one axis, and the axes move the correct number of mm when you issue a G command (and it's not a matter of steppers skipping), then it's likely backlash. Sounds weird, but it'll sometimes pop up in, say, circles, but not in squares for some reason (current theory - the changes in speed over a circle's X and Y function exacerbate it). Check your belts, tighten them if not tight, and more importantly, check your belt clamps. You can have a tight belt and loose clamp, causing backlash despite a taut belt. Also check the pulleys just in case (are they centered, are they eccentric, are the set screws tightened). I'm not an expert, but maybe take a look at your acceleration and jerk settings for the circles. 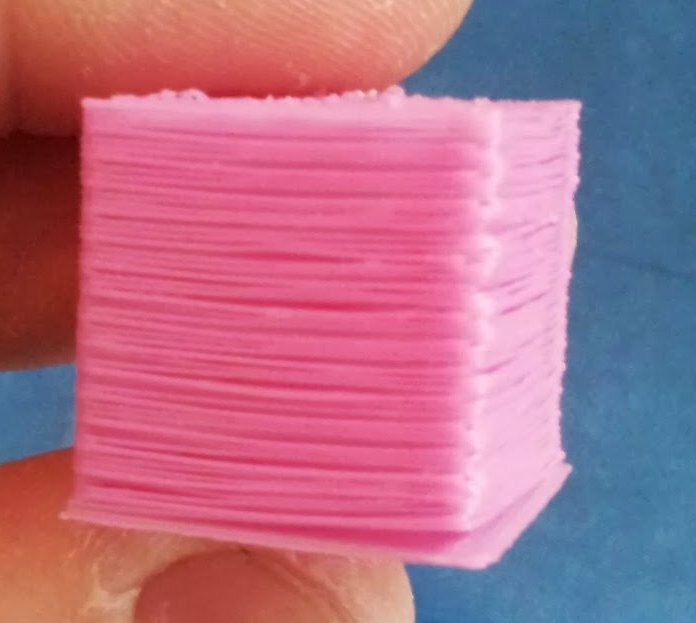 And for the infill not connecting, perhaps your calibration for flow is off? I'd make the assumption that there's not quite enough plastic spreading out to make the proper connection. I'm really stumped on this making round circles thing. I checked my X and Y calculations and confirmed that when I tell this thing to move 10mm in either axis it indeed does. I wonder if it is related to why the walls of my prints aren't always aligned with my infill. There is a gap sometimes as seen in this picture. Does anyone have any thoughts on this? 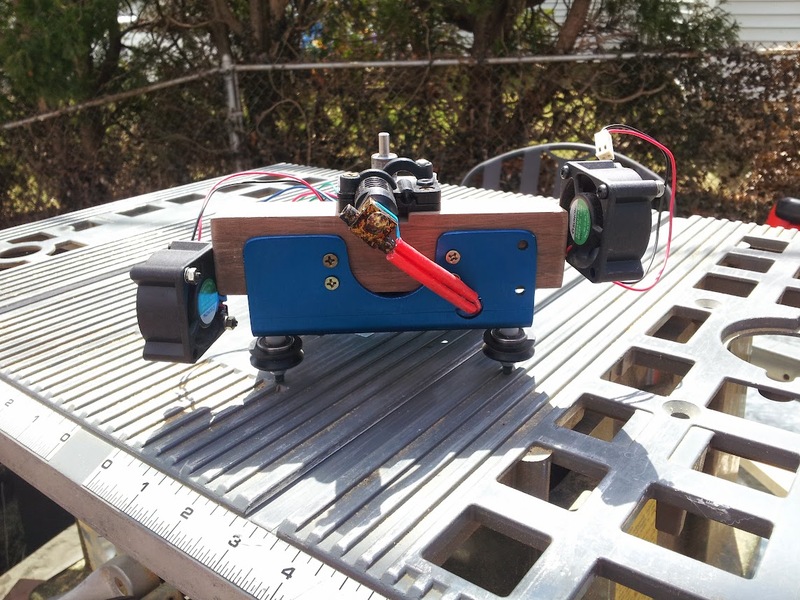 I also printed out the ord bot logo in its not so round state and a handle for my new filament box built with my Dad from my grandfather's home cut lumber using trees from his grandfather's land (which is still in the family). My daughter helped us build it. I love the story and history in that box! 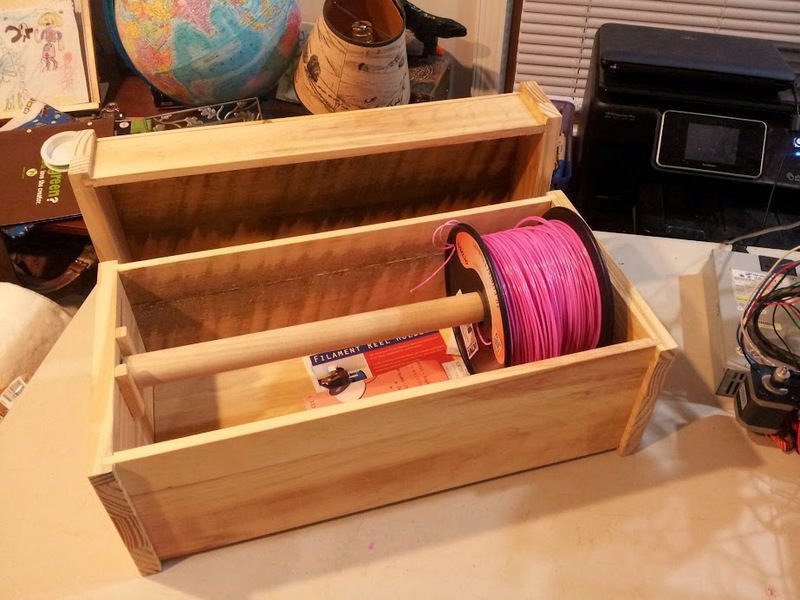 I've been meaning to build a spool holder container for my filament. I have some plexiglass that may be a good start. maybe I can just fill the bottom with rice too. Right now it is just a dowel across a couple boxes. What sort of humidity causes problems like this? I don't think of the room it is in as generally high in humidity. flickerfly wrote: Thanks Orcinus, it's interesting that you'd see it consistently like that. I'll go ahead and lower the extruder temperature a bit and see if things change. You can also try storing your filament in dessicant to remove any moisture. Thanks Orcinus, it's interesting that you'd see it consistently like that. I'll go ahead and lower the extruder temperature a bit and see if things change. I've had similar issues caused by outgassing from the filament, yeah. And no, it doesn't have to be irregular. The "bubbling" that i've seen was very regular in straight sections. If the filament was soaked consistently, the steam will build up periodically. Worth trying another filament / lowering the temps so you can eliminate outgassing as the cause. I thought I'd figured out that my little holes were retraction, but that doesn't seem to be the case. Now I'm realizing that I'm hearing popping sounds in my prints and thinking I may be getting moisture or I'm just heating it up too high during extrusion, The heating and moisture don't really ring true though due to the consistency of the holes. Wouldn't that be inconsistent, yet I can print the same thing on two different days and it will result in the same holes in the same or nearly the same places. This includes running slicer on it two different times. The "pimples" in this were from me trying to fix the holes using retraction, but just causing more problems. 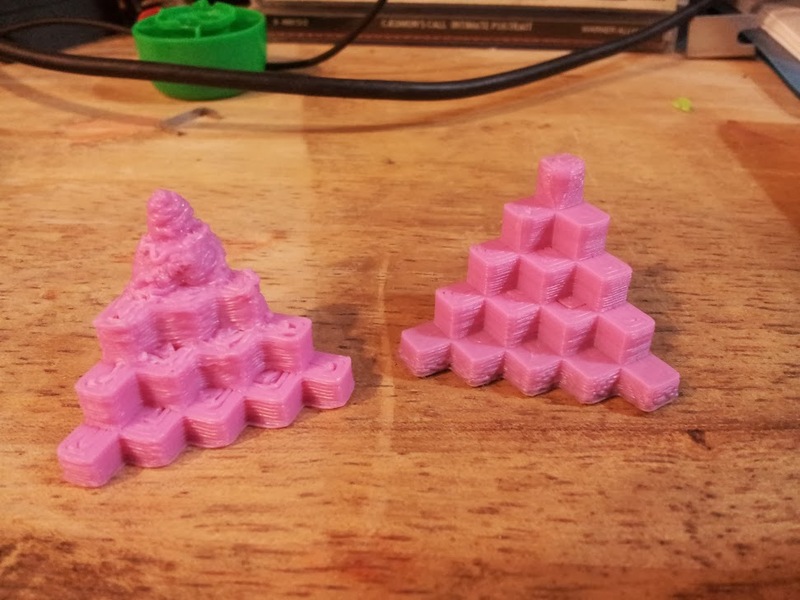 The holes remain and are consistent despite retraction settings as seen in these two prints. 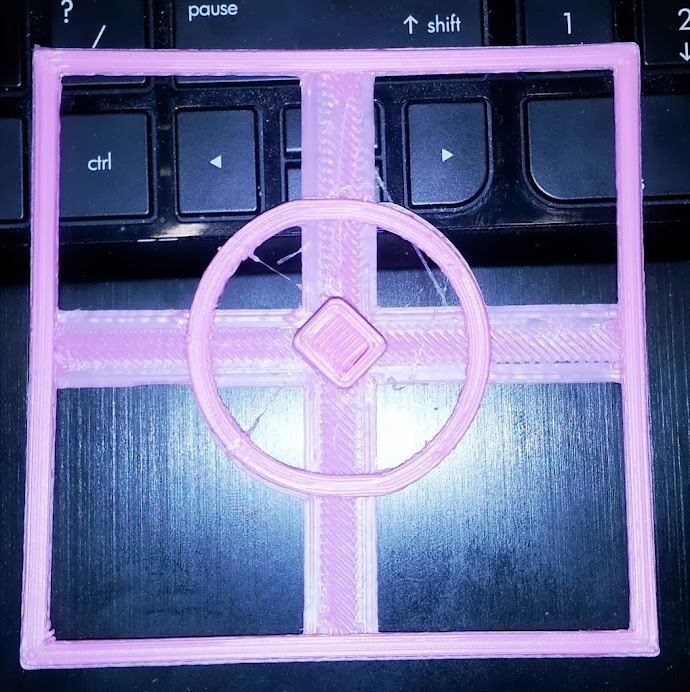 I'm wondering if the circle issue is related to the holes since I seem to see them more on round parts and the round parts are stretching on the X axis so maybe pulling the plastic. Here's the view from above on some round prints. I'll keep studying, but if you have some experience that suggests what I'm seeing, I'll gladly take it. I have the default slic3r 3-layer perimeter and the infill was .4 or more on every layer. 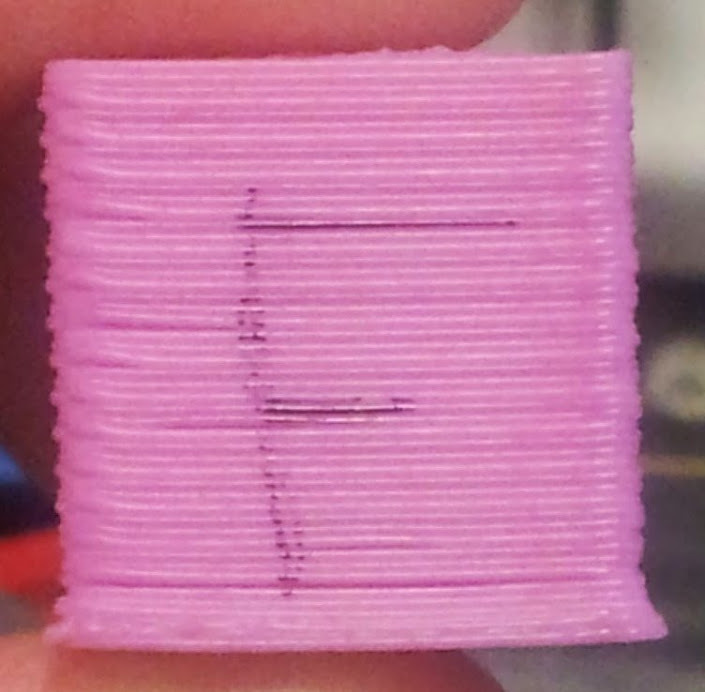 Also, it was messed up before the rest of the head printed so I don't think it was a support issue. It actually browned the plastic on the back so I'm wondering if there is some sort of heat issue, but it only happened where it skipped between the tail and neck so I had a bit of ooze. Am I running to hot and burning the plastic when it sits in the nozzle rather than running through it? Edit: As I was looking more closely, I noticed lower on the neck across from the tail that there was actually a line up the head where the plastic was missing. 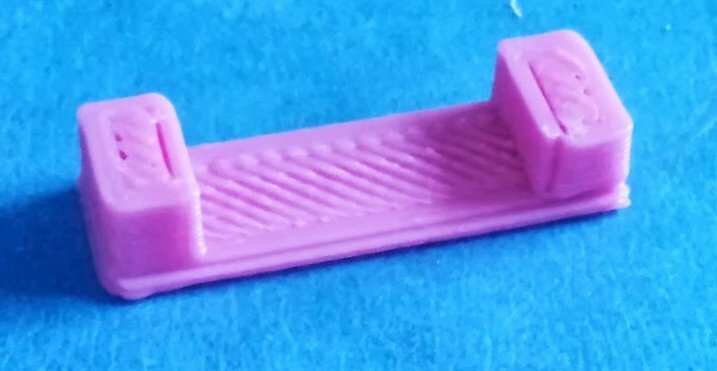 Thinking back, I've also noticed little holes like that in other parts and maybe one per layers so I was wondering if the retraction was overly aggressive and reduced it. Moving it to .75 actually caused what I've seen called "pimples" in other areas of the parts. Seems retraction was not the issue. Another problems I need to look into is the poor quality of my round parts. They have clear stretches to the back left and front right. 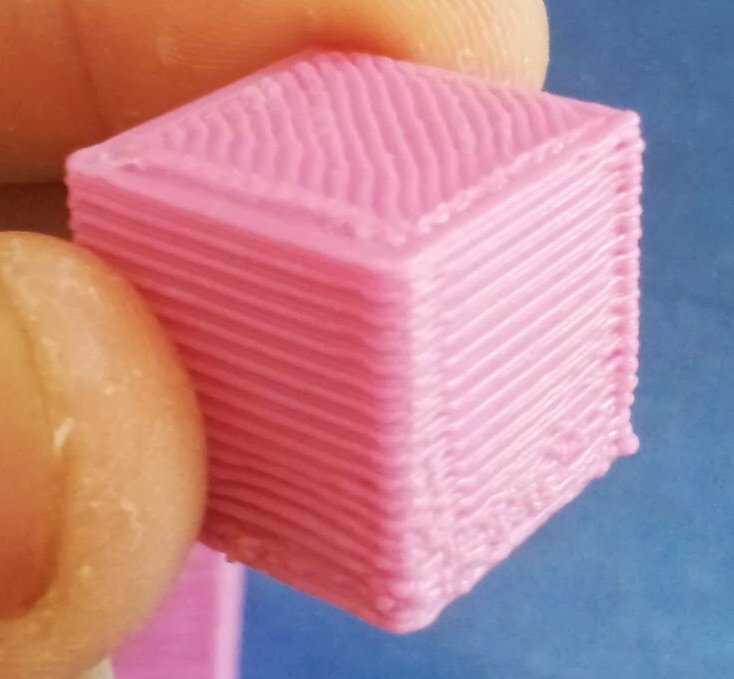 What are you using for minimum perimeters and infill? Is it possible that the walls are too thin so on the steep angles there's not enough support for the outer perimeters? 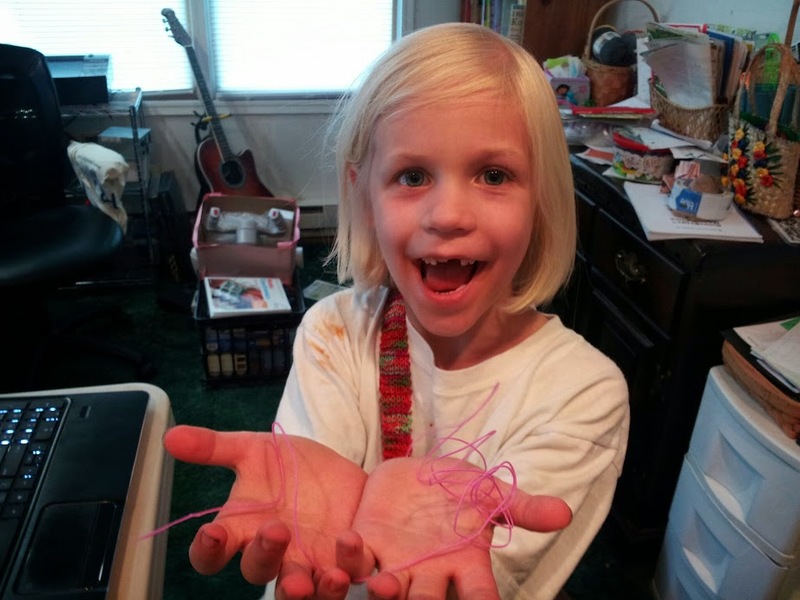 My daughter turned 7 thursday, but her enthusiasm for the Ord Bot Hadron has not suffered as a result. She made a special request for a Chess Set. I'm not sure where she picked up that idea, but we toured Thingiverse until we found a fun kitty themed chess set that she wanted to try and sat in my lap for as long as I'd let her watching it print. Below is the results. The one thing I noticed was that the oozing was a problem, as seen in the tail and the layers in the neck corresponding to the tail. I assume that is all ooze related. Any advice on dealing with that better? I'd like to fix that before I print out the rest of the pieces. flickerfly wrote: I also tried flurin's hair band for my daughter. I have had some trouble getting the ends to stick to the bed. His shows some sort of square anchor, but slic3r isn't doing that for me. It is pushing the boundaries of my printer a bit so turns out to be good for my education. In Slic3r Setting>Print settings>Skirt and brim you can set a brim (eg. 4mm), however this will surround the entire object (it's added to the first horizontal shell). I finally spent some quality time with the uprights and have much better results. 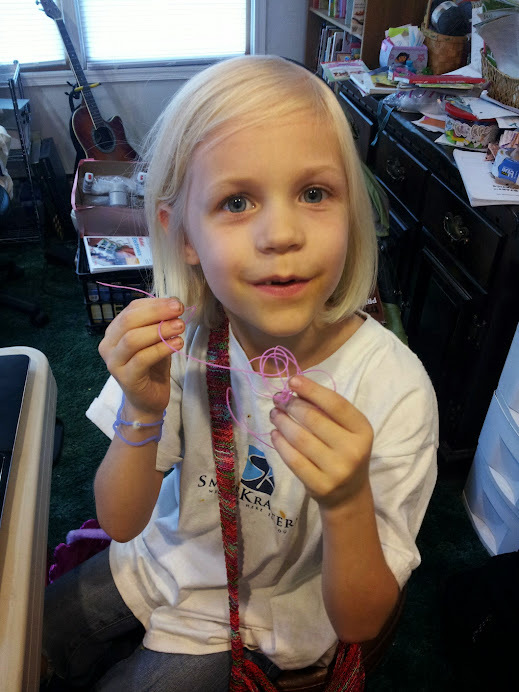 Z-wobble is now largely mitigated and Z-ribbing also. Now I'm playing with temps for the various parts and slicer settings. This image shows the improvement. It also shows some, what I believe is, over-heating of the bed causing the layers to collapse. I went a bit more adventurous and tried a 1/2 sized version of myself that turned out better than I expected. The green one a friend printed months ago and is there for reference. I also tried flurin's hair band for my daughter. I have had some trouble getting the ends to stick to the bed. His shows some sort of square anchor, but slic3r isn't doing that for me. It is pushing the boundaries of my printer a bit so turns out to be good for my education. Having the temp tables accurate isn't a requirement for successful prints. In fact, you can be 10 degrees off and it still wouldn't matter. Each filament is different anyways (even batches from the same filament maker can vary a lot) and you need to go through a few meters testing at different temps until you find a sweet spot. FWIW, i never calibrated mine - i've been using the stock EPCOS 100k tables since day one, despite not using an actual EPCOS. For a long time, i didn't even bother calibrating the hotend PID values. It's not the accuracy that's important, it's keeping the temperature stable and finding the sweet spot for your particular filament (and print type). Do you have a way to verify the hotend temps? I have a multimeter with an external thermocouple that I use to verify. It's important that you confirm this because the temp readings are subject to positional errors. Most people dial it in manually over time, but just checking it is faster. I gave those ZAXIS_STEPS_PER_MM = 2519.68504 settings a try with a .4 layer height. It does appear to improved some larger inconsistency that was on top of the finer inconsistency. Perhaps I was dealing with both and now I have one less problem. Thank you! Also, I changed the skirt and the flare at the bottom was made smaller so that solves that and I know I don't have to worry about it. We're slowly making improvements so that's good. That was an interesting article. I'll try the settings you shared next time I get some time to sit in front of my printer. I'm rather excited about this development. Thanks for sharing. I'm not sure this is Z wobble so much as Z ribbing. The constrained Z axis with the maker slide makes Z wobble nigh-impossible (assuming your eccentric spacers are tightened correctly). Have you read this article: http://goo.gl/ci9Gz ? We have the same Hadron kit from ATI from the same batch and we both have X3's... I have mine set for 16x microstepping (not required, but doesn't hurt). My ZAXIS_STEPS_PER_MM is 2519.68504 (I calculated it then confirmed with a dial indicator). I've only tried printing at .2mm and .4mm so far. For these layer heights I calculated the step-corrected height as .1984375mm for the .2mm target and I just multiply by two for .4mm height (.396875). When I get around to refining further I'll probably get better numbers than this, but at least they should fall closer to step boundaries and avoid the errors that result in ribbing. If you're still stuck on this you might give this a shot and see how it works for you. My build isn't having any issues like this... mine are more to do with temperature calibration. I spent all day Sunday creating new thermistor tables for my build. Here's my second or third print. You can see that I don't have the Z issues ... the specs throughout are from temp being too high, as well as the mid back. As far as I can tell (a lot of the calibration Wiki's in the reprap world are outdated) it's best practice now a days to stick with the mathematically calculated values. They should be "close enough" and if not it's probably a mechanical error. This is especially true for an Ord Bot with manufactured pulleys instead of printed ones. If you are calibrating to a test object your calibration might only be accurate on objects that exact size, then when you print a larger item the errors you compensated for will then become bigger errors. In this case the math is way to far off of actual to start "fine tuning". After printing I would see how well it fit and adjust my settings slightly to bring it closer in, I printed 3-4 of these total to get a nice fit. In an ideal world I would have liked to calculate the settings to get them bang on, but this was pretty easy and was effective enough for me. Thank you Gadroc. I wouldn't have thought to actually count the teeth. The ATI Shipping List also says it has 20 teeth, but if you had 18 I better check that when I get home. I can certainly see how that would make a difference. I'm fairly confident given another look at my stepper's data sheet that 1.8 deg/step is accurate for that stepper. I'll look at the X3 board again and make sure I didn't confuse the 1/16 jumper settings with the 1/32. That's all done with jumpers on the board right? There isn't any settings in the firmware to make in addition? For your X/Y it looks like you have two problems. One it looks like either you have a 0.9degree steppers or you have set micro-stepping to 1/32. Second your pulley tooth count may be wrong. 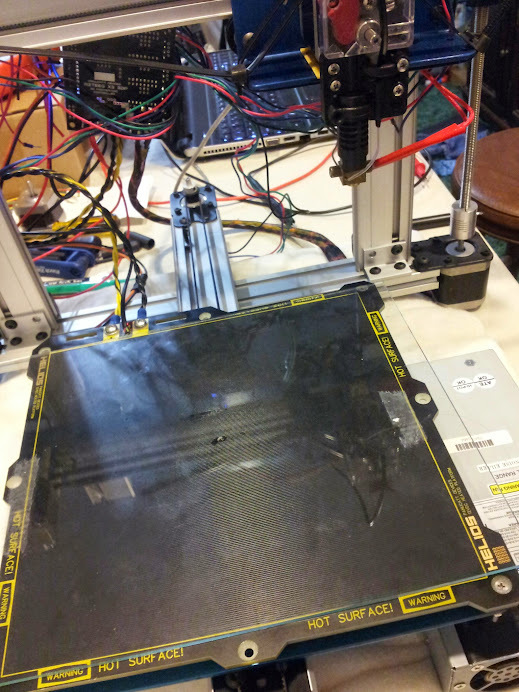 Looking at ATI's website looks like they are reselling reprapdiscount products now, and when I my kit from reprapdiscount I got 18 tooth pulleys not 20. I would actually count the teeth on your pulley. 2560 is accurate given 1.8degree steppers. Double check that as well. I found that I hadn't set anything in the microstepping options on the X3 so I pulled the drivers off and set those for 1/16 (see SD8825 Drivers Datasheet). Then I found this nifty calculator over at Prusa's website. I looked at the data sheet that ATI provided on the steppers, BOM to find the MXL belts and found the details on the pulleys. I went into Repetier host, hit Alt + E to open up the firmware settings and put that in for the X and Y. Suddenly, things started to move as expected over distances that are much closer to accurate. The distances aren't bang on, in fact they are actually off by a lot, but that's an improvement. I measured the X-axis with a 100mm move and it went 39mm. Clearly some work needs to be done. 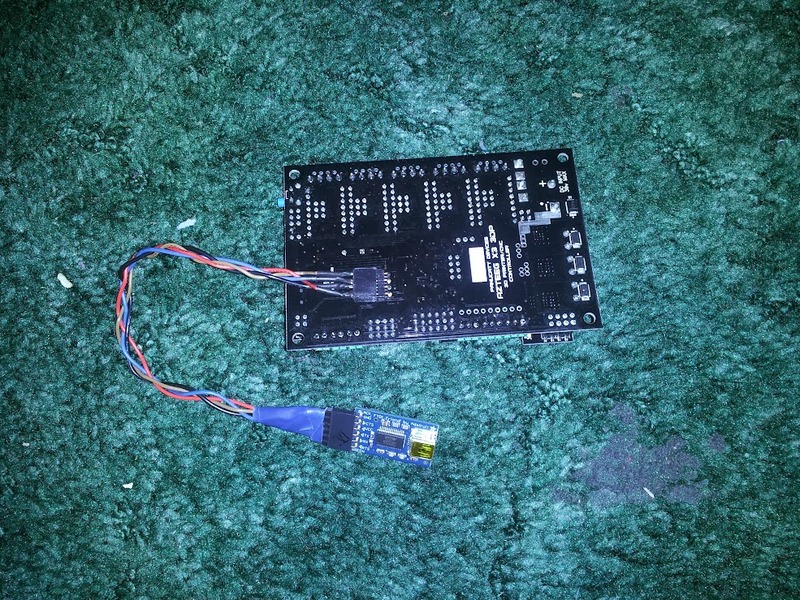 Over the two short period that I had this up and running, the drivers became extremely hot; the Y driver was almost to the point of burning to the touch the first time and the next it was was the Z driver (which still doesn't move). I'm letting them cool down right now. My first instinct after cutting the power was to turn the pots down a little bit. The drivers are sometimes making lots of whiny noise in certain positions, but they were doing that before. While I was playing with Prusa's calculators, I also tried out the "Optimal layer height for your Z axis" calculator. I found out the following using the M8 lead screw preset giving me 1.25mm/revolution. I'm not sure what this chart does for me at this point, but I'm plopping it here for later reference. Oh, and the "Steps per millimeter - leadscrew driven systems" calculator from the same place is relevant to the Z so here's the result of that calculation using nothing not already mentioned in this post. NOTE: These aren't well tested and tuned values, just some calculations that will hopefully get me in the ballpark. Finally getting a chance to come back to this. My daughter and I played with it some and make things move a bit. I'm not sure where to find the right information on calibration and I'm not certain my power supply of choice is actually powerful enough. I feel a sharp rise in the learning curve coming on. So, I (think) I have all the stuff. I've rigged up the X3 with the motors and the X and Y axis move around some. 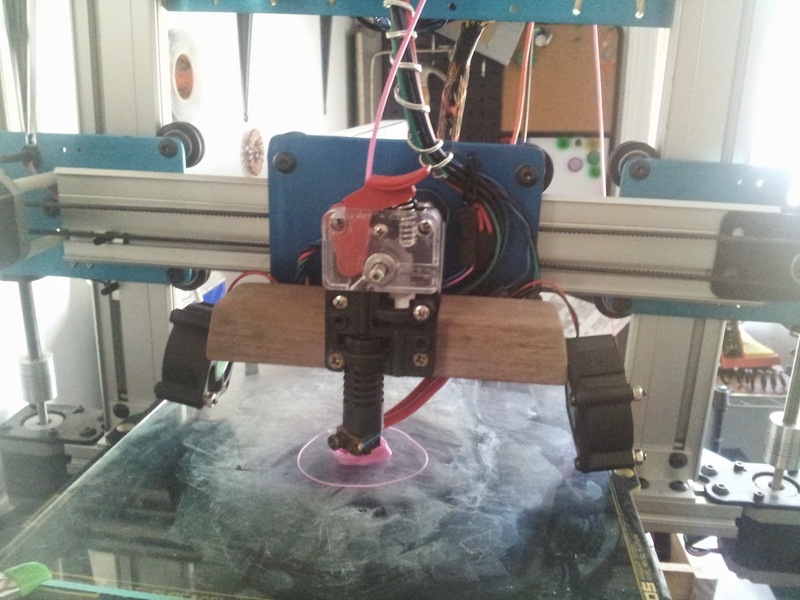 The Z-Axis doesn't at all though it holds its position and won't manually move easily once given a command. I have the repetier firmware and host 0.85b that I'm playing with. When I manually tell both the X and Y axis to move 1mm it seems a smaller move or awfully close to the same as the 0.1mm move. When I tell them to move 10mm, they don't move at all. Anyway, I'm going to play with it some more tonight and try to get the endstops hooked up and verified as functional. EDIT: Okay, I found that the travel of both the X and Y in repetier is a total of 12 (is that mm?) rather than the 200 I was expecting. I guess that probably means I have some firmware config issues. Thanks for the info, best of luck on the rest of the build! bwevans wrote: How long did it take between ordering and receiving the kit from ATI? It was real fast, as fast as anything I ordered. I ordered on May 4th and it arrived May 8th. It originated in Palatine, IL and was shipped UPS. It came in great shape. I've since ordered another item from them on Sunday. USPS says it'll be here Thursday. Smaller package so USPS makes more sense. Also, they are on the list of companies that pay royalties back to Bart for the design so that's a plus also. The only complaint I had turned out to be my own fault. It does not come with holes for the cables drilled in the makerslide, but I'm not sure how I want to do that yet anyway so I appreciate the flexibility. How long did it take between ordering and receiving the kit from ATI? My daughter is under the weather so the build didn't progress, but we did buy what I think are the last few things we need. Since the J-heads can be purchased in parts from hotends.com we did that. We also opted for a heater cartridge. In a moment of mental drop-out I ended up with two steppers, That may come in handy anyway.